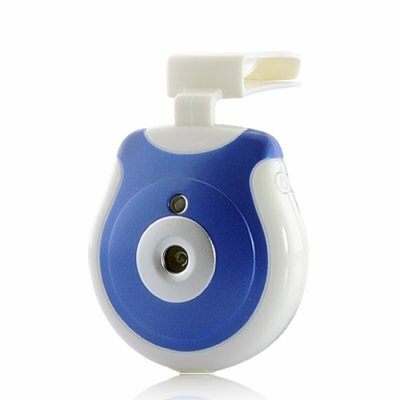 Successfully Added Pet's Eye View Clip-on Digital Camera to your Shopping Cart. Pet's Eye View Clip-on Digital Camera: Capture what your pet really sees! Enter the world of your lovely pet with this high quality Digital Camera especially designed for them. If you have ever wondered how your dog, cat and rabbit spend their day you will finally know! You will also discover who is responsible for eating wires, messing with your stuff, breaking the Cup you won after years of intensive training (remember their innocent face when you stepped in the room and became mad...). Just clip this mini image recorder onto your pet's collar and find out what they really do in your home while being at office or shopping! The great Pet's Eye View Digital Camera has a timer allowing the device to take a snapshot (in friendly JPEG format) automatically every 1.5 or 15 minutes. Once you are back, simply transfer the photos to your computer through the provided USB cable. It is plug-and-play so no software is needed. Then use this photographic evidence to blame the one who chewed up your slippers and reward the loyal protector of your bedroom! Also catch this opportunity to create the first photo book of your best friend’s life based on their own way of seeing! Live the exciting life of your cute pet with this awesome Pet's Eye View Clip-on Digital Camera! Brought to you by your trusted online source of cool and friendly gadgets, Chinavasion. Capture what your pet sees! Ideal to create a photo album of your pet's life. Charge the device directly through the provided USB cable. Neither weatherproof nor waterproof. Do not use outside. on 2011-08-24 21:08:16 awesome but need one thing....video ! !